The data, from comScore. Indicates that 45.1 million visitors accessed the Internet via desktop while 36.4 million users browsed the web via mobile. 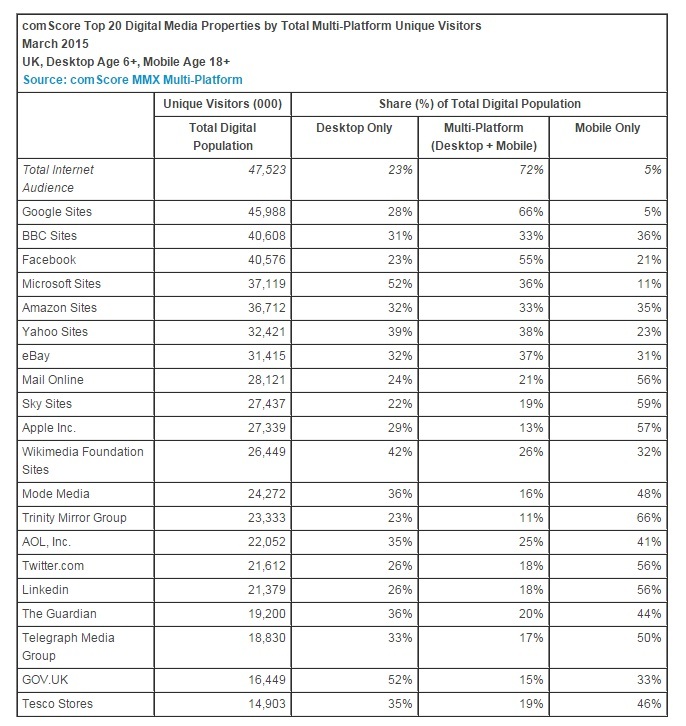 According to comScore MMX Multi-Platform, which provides an unduplicated view of usage across desktop, smartphone and tablet, Google Sites ranked as the top property with nearly 46 million combined desktop and mobile Internet users. The majority of Google Sites’ audience visited from both desktop and mobile platforms (66 percent), while 28% visited exclusively from desktop and 5% were mobile-only users. BBC Sites was the second most popular online property with a multi-platform audience of 40.6 million, 36 percent of which were mobile-only.